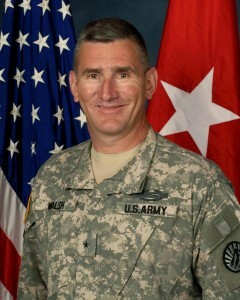 Brigadier General John E. Walsh assumed the duties as the Adjutant General for Montana on 1 September 2008. General Walsh is the Adjutant General for the State of Montana, Commander of the Montana National Guard and the Director of the Department of Military Affairs. He is responsible to provide Army and Air National Guard military forces that are fully prepared to protect Montana from any threat, disaster, or emergency. He is also responsible to ensure that Montana’s National Guard Forces are ready to deploy worldwide and accomplish military missions in support of the national defense strategy. As the Adjutant General for the State of Montana, he administers/commands a joint federal-state program to provide for the organization of the Montana Army and Air National Guard. He is responsible to the Governor for disaster and emergency services, homeland security, veteran affairs, a Counter-Drug Support Team, a Civil Support Team, and a Youth Challenge Program. General Walsh graduated from the United States Army War College with a Masters Degree in Strategic Studies in June 2007. General Walsh also served as the Battalion Commander of the 1-163d Infantry Battalion while deployed to Iraq in support of Operation Iraqi Freedom III from December 2004 through November 2005. General Walsh was born in Butte, Montana, and graduated from Butte High School in 1979. He attended Carroll College from 1979 through 1984. General Walsh is married to Janet and they have two children, Michael (22) and Taylor (18), BG Walsh and his family reside in Helena.